Strength – 48.2 % Vol. 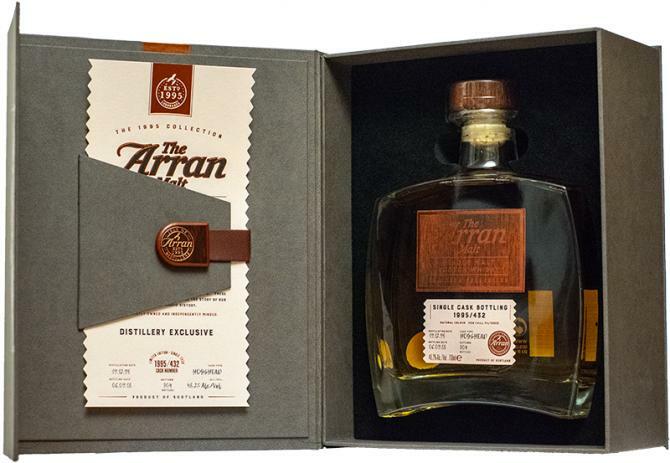 Arran 23 year old is an incredibly rare whisky distilled in 1995, being one of the first hogsheads laid to rest at the distillery. Bottled in 2018 as a 23 year old, this was an Investors barrel. In fact Mr McBeth commissioned two barrels, following on from this, he sold one back to the distillery due to demand of the liquid running low. He chose to bottle half of the second hogshead, which has allowed us to gain a few bottles. This means you have a chance to own a piece of history. Nose: Hints of cinnamon buns and beeswax furniture polish. The fragrance reveals a “old” whiskey. Crushed black pepper and cotton candy. Classic Arran-apple character with fresh, ripe pineapple. Palate: Velvety and soft, oily and full-bodied. Soft wood tones, pine, oak, sweet figs, honey, leather and perfume with hints of smoke. Finish: A beautiful and noble dram, representing the age proud, coca and dried fruits rounds out from the typical Arran apple notes.